[£1,825 OF FACTORY FITTED EXTRAS] This luxurious Audi A4 has the Balance of Manufactures Warranty Remaining, One Registered Keeper, Two keys and has been Serviced to the Manufactures Service Schedule for the Sale +++ An RAC BuySure inspection has been carried out on this Vehicle. This includes an RAC 82 Point Preparation Inspection, Car Data History Check, 12 Months RAC Breakdown Cover including Roadside, Recovery, At Home & RAC Accident Care +++ WE DO NOT CHARGE ANY ADMINISTRATION OR HIDDEN FEES ON OUR PRICES +++ Grimsdyke Car Sales is a Family Run Business Since 1964. 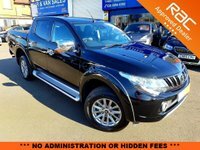 We have some very competitive finance packages and have more cars available please visit our website www.gssgarage.co.uk for more information. Part Exchange Welcome.